I face a terrible dilemma with this book. Part of me wants to jump right in and start sketching and colouring, cutting and pasting (and yes, I am an adult! ); while another part of me can't bring myself to mark a book as beautiful as this one! Part picture book, part activity book, this is one of the most glorious explorations of creativity that I've seen in a while. It begins with the Artful Sketcher inviting you, the reader, to join him on a tour of the Little Factory of Illustration. 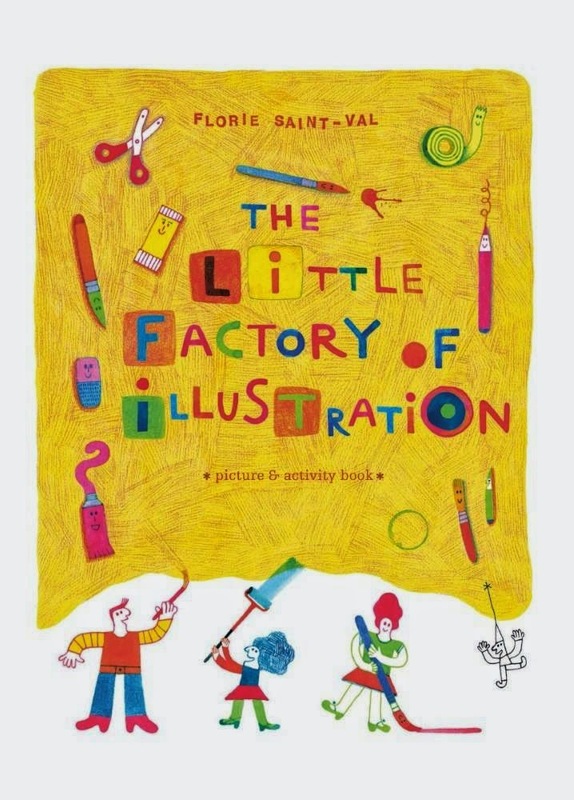 The factory is filled with all manner of artists, such as curly-haired Miss Line (responsible for drawing); Roxy, Jojo and Bob (responsible for loading up the colour fountain); and Doodler (responsible for, well, doodling). As you move through the levels of the factory, up and down the various passageways and past all the amazing machines, you're invited to jump in and get creative yourself. Perhaps you'd like to fill a page with a drawing made of a single line, without ever lifting your pencil from the paper? Or perhaps a collage to brighten up the coat of Raga Man is more your thing? There's also the chance to play games like the Lulugram or domipics (and all you need to play along is supplied in a games pocket at the back of the book). By the time you've worked your way through the book, you've become a fully fledged artist, with your own 'office' in the factory and a major exhibition in your honour. I simply love this book. Kids from the age of 5 up will be able to enjoy at least some of the activities, while slightly older kids will be able to entertain themselves for hours. I can think of no higher recommendation than the fact that I have hidden this book from my daughter, with the intention of bringing it out on our long-haul flight to the UK later this year. If it doesn't help keep her occupied through 28 hours of flying, nothing will!